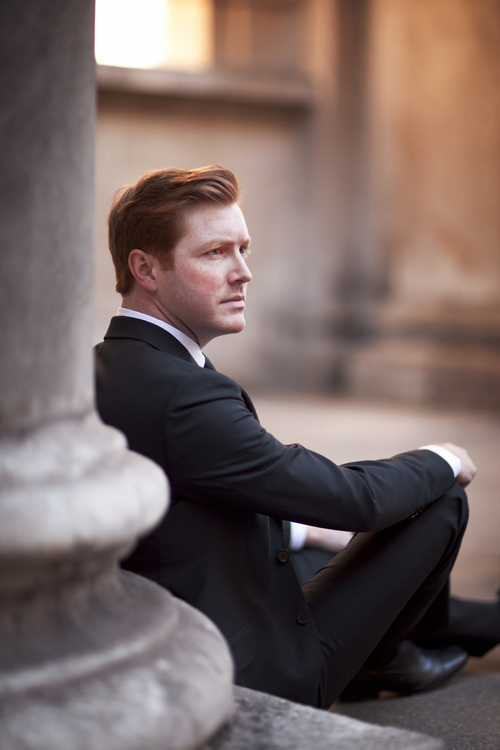 At the end of the afternoon concert on Sunday 29 January 2017 at Wigmore Hall, counter-tenor Tim Mead introduced his encore and took the opportunity to say that the recital had been his first ever song recital. Though well known in baroque music, oratorio and opera, this was a new venture into song as, accompanied by James Baillieu, Tim Mead sang a selection of English song which he described as 'songs he'd heard throughout his singing career and jealously wanted to sing'. The emphasis was on 20th century with songs by Herbert Howells, RVW, Roger Quilter, Betty Roe, John Ireland, John Dankworth, Peter Warlock and Benjamin Britten, but there was Purcell too (in Britten's arrangement), and Charles Villiers Stanford, plus Joseph Phibbs more contemporary piece. The Phibbs and the Roe were all specifically written for counter-tenor, all the others presumably the composers expected the high voices to those of women. But throughout the programme, which was sung from memory, Mead really made the music his own, making his innate sense of line work for him. If there were awkward register changes then they were not apparent, all seemed ease and fluency, with a lovely evenness of tone from top to bottom, combined with a lovely sense of the texts. We opened with Herbert Howells King David with the elegant melancholy of Mead's line complemented by Baillieu's fluent piano, with some lovely nightingale moments. In many of the songs, we noticed the sheer beauty of Mead's tone, but he did not coast along and each song was a little narrative, with a sense of character. RVW's Linden Lea was finely controlled, with intelligent shaping of phrases and supremely communicable words. Britten's arrangement of Purcell's Lord, what is man? used a very strong piano accompaniment to the lyrical arioso, which mean that Mead was able to sing rather more strongly than if he had done the song in its Baroque version. There were some lovely rhapsodic moments but his Baroque background told in the finely executed runs at the end. Roger Quilter's It was a lover and his lass was light and charming, though with a serious undertow, and a nicely insouciant piano from James Baillieu. RVW's Silent Noon started with Mead's voice reduced to a fine thread, and both performers induced a languorous sense of calm. Stanford's early Keats setting La Belle Dame sans merci started off quite spare, with a sense of quietly melancholy, but as the knight told his story Mead changed the mood to narrative charm, developing a sense of the drama. Baillieu had some lovely illustrative moments in the piano, such as the galloping horses, and the climax was thrillingly vivid. Betty Roe's To his sweet saviour, setting Robert Herrick, dates from 1978 and started with a florid Tippet-esque piano introduction, leading to a lyrical arioso, complex yet expressive with atmospheric piano comments. The second verse was more structured, with a sense of lyrical song, and a strong feeling of Roe's musical personality. John Ireland's If there were dreams to sell was simple and direct, with a lovely lyricism to it. Joseph Phibbs' The Moon's Funeral, setting Hilare Belloc, dates from 2008. Starting quite plainly with plangent tone from Mead and expressive chromaticism in the music, the piece developed quite a sense of unnerving atmosphere a its climax. On the recital stage, Tim Mead had quite a serious demeanour, but there was a nice sense of intimate confiding in the songs, just him and us. And he displayed a strong feel for the quiet rapture and mysticism of many of the songs. RVW's late song Tired, setting words by Ursula Vaughan Williams, was quietly moving, with a sense of the underlying elegiac tone of the song, and Mead's feel for a shapely line did not preclude superb diction. Howells A Madrigal was rather perky, full of sober charm. John Dankworth's Shakespeare setting, Shall I compare thee to a Summer's Day was written for Cleo Laine, but Mead and Baillieu very much made the song their own creating something cool and slightly bluesy, illuminating the words. Peter Warlock's Love for Love flowed in a beautifully relaxed Manner whilst there was a simple directness to Britten's arrangement of O Waly, Waly, making the emotions of the song really tell. Finally a nicely insouciant account of Roger Quilter's bright and breezy Hey, ho, the wind and the rain. For our encore, we were treated to Purcell's Music for a while. We could easily have listened to a lot more, and I hope we do not have to wait too long for Mead's next foray into song recital.